The first, published in Scientific Reports by Exeter’s Mark Robinson and colleagues (including TPRG’s Frank Mayle and Macarena Cárdenas), aimed to address a circularity in existing studies: fossil pollen is used to reconstruct past vegetation, which is then used to infer past climate, so all vegetation changes appear to be perfectly explained by climate. Here, Robinson et al used an independent record of rainfall (the Botuverá speleothem) to show that southern Brazil’s climate was reasonably stable over the past millennium, raising the possibility that this forest expansion had another cause. To examine the potential human contribution to the expansion, the authors first modelled Araucaria forest’s distribution in the landscape: in areas with little human impact it appears to prefer shadier south-facing slopes, with campos occupying the north-facing slopes and plateaus. This pattern doesn’t hold so effectively for archaeology-rich areas though, where fully one third of forested areas are in places the model suggests should be unsuitable. So, are these areas anthropogenic? To find out, Robinson et al examined soil pits across valleys near to and far from archaeological sites. In their archaeology-free control site, the vegetation in all areas – the south-facing forest as well as campos on north-facing slopes and the plateau – has been stable for 7,500+ years, as expected. 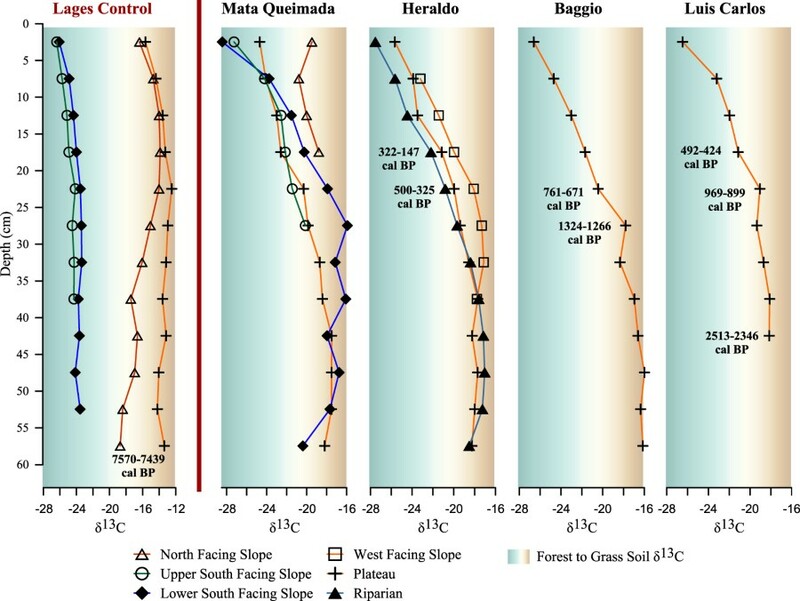 In areas around archaeological sites, however, all areas show a marked shift from campos to forest around 1,000 years ago, when human populations nearby were building towards their peak. Given the stability of the regional climate at this time, it certainly appears that these forests likely had some human help in reaching their present distribution. This is also the conclusion of the second study, which uses very different methods and scales to address the questions around Araucaria forest expansion. In it, Miguel Lauterjung and colleagues characterised the diversity of chloroplast DNA in Araucaria trees across southern Brazil, looking for evidence of past human actions in its present population. Their findings – negative deviations from neutrality, a star-shaped haplotype map, and 96% of variability within (not between) populations – all suggest a population that recently and rapidly expanded from a single source. That source, the authors suggest, was a glacial refuge in the Serra Geral highlands. They estimate that it should have taken at least 20,000 years for the forest to reach its modern extent from there, and since pollen records in the Serra Geral don’t show any forest expansion until at least 4,000 years ago, they conclude Araucaria must have had human help. The evidence for Araucaria spending the Last Glacial Maximum (LGM, 21,000 years ago) confined to a single refuge in the Serra Geral seems a little thin, though. It mainly comes from a distribution model in a previous study (which only considered areas above 900m elevation), but pollen records in the area show that any forest areas were likely confined to river valleys. These riverine forests almost certainly acted as microrefugia, but they probably weren’t the only areas where the forests withstood difficult climate conditions. Indeed, distribution models I’ve built (below) suggest that Araucaria could have inhabited quite a wide area at the LGM, including a lot of space to the west of the region. This is corroborated by a little-known pollen core in south-western Paraná (631m elevation) that records continuous Araucaria forest for the last 13,000+ years – the oldest terrestrial record of Araucaria forest in the southern highlands I’ve come across. This would explain how Araucaria appeared to colonise such a wide area so quickly – it essentially had a head-start. However, this by no means discounts all of the study’s findings – the genetic evidence of Araucaria’s rapid, recent spread dovetails nicely with the soil isotope evidence that attributes the forest’s expansion to human occupation. Together, they lend weight to the idea that the forest’s most recent spread was significantly aided by the people whose lives depended on its resources, and that the expanded forests were further altered by their human inhabitants. These findings are a reminder that the remaining fragments of Araucaria forest have more than just biological significance – they represent the endangered heritage of a near-vanished culture as well. These themes – Araucaria forests, their climate change refugia and people’s influences upon them – are ones that I’ll be continuing to explore throughout my PhD, and I hope I’ll be able to contribute more evidence and clarity to this debate over the months and years to come! This entry was posted in Je Landscapes, Publications and tagged Oliver Wilson. Bookmark the permalink.